Our three bunnies had been living in bunnies hutches in the chicken yard. The bird netting above the chicken yard and lack of storage made our daily chores with the rabbits and the chickens a little frustrating. That bird netting has worked great to keep the hawk from eating our birds, however it has almost decapitated me EVERYDAY. We had been putting the bedding, feed and hay in the basement. I knew it would be just a matter of time before we would get mice. We had been brainstorming about what we were going to do long term, thinking about building a shed. On the way home from strawberry picking we stopped by a road side Amish shed place. We just wanted to brain storm and see what was available. After talking to the salesman we found out that they had used pre-built sheds for very reasonable prices. 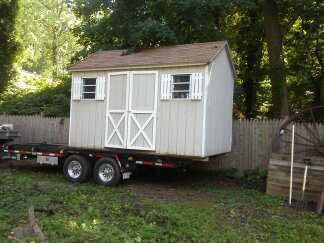 We bought a 10 x 12 pre-built shed. It would be our Bunny Barn. Inside the Bunny Barn we built two level bunny cages on two of the walls. We have wire cages with a slanted shoot underneath. The shoot empties into a rain gutter and the gutter empties into buckets that are than emptied into the compost bins. 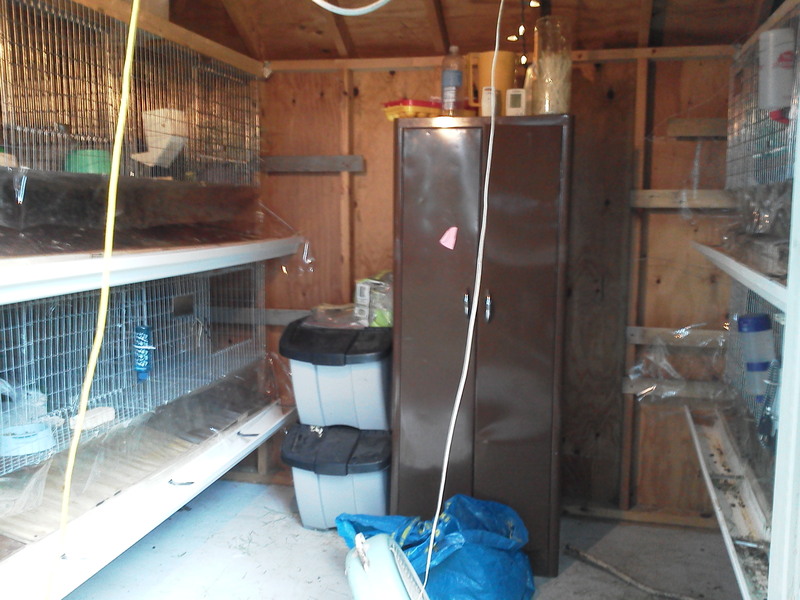 The Bunny Barn holds eight 3 ft x 3 ft rabbit cages. The slanted shoots under the cages are built out of plywood and covered with plastic vinyl. We have learned that the plastic vinyl is not a good idea, we will be replacing it with another material in the future, but the bunnies need to start earning their keep first. 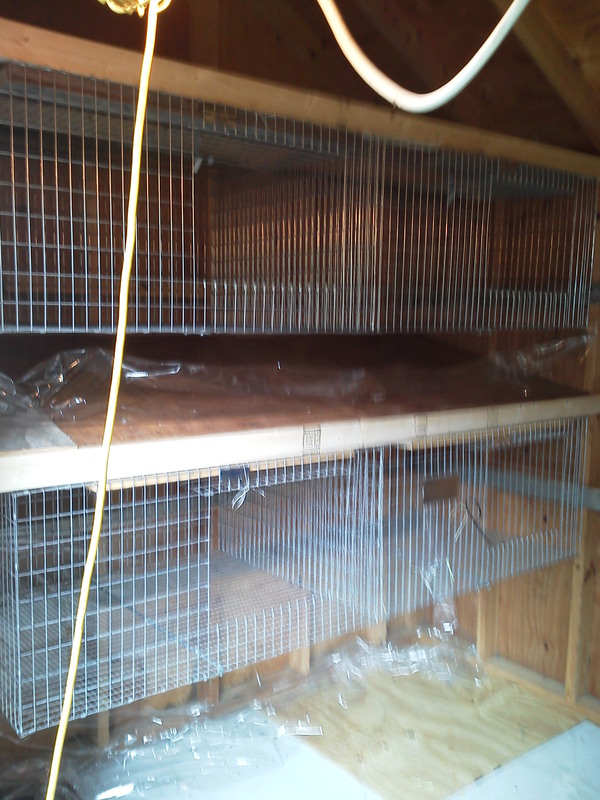 I got the idea for the rabbit cage set up from http://willowcreekfarm.wordpress.com/. They have a similar set up in their barn. 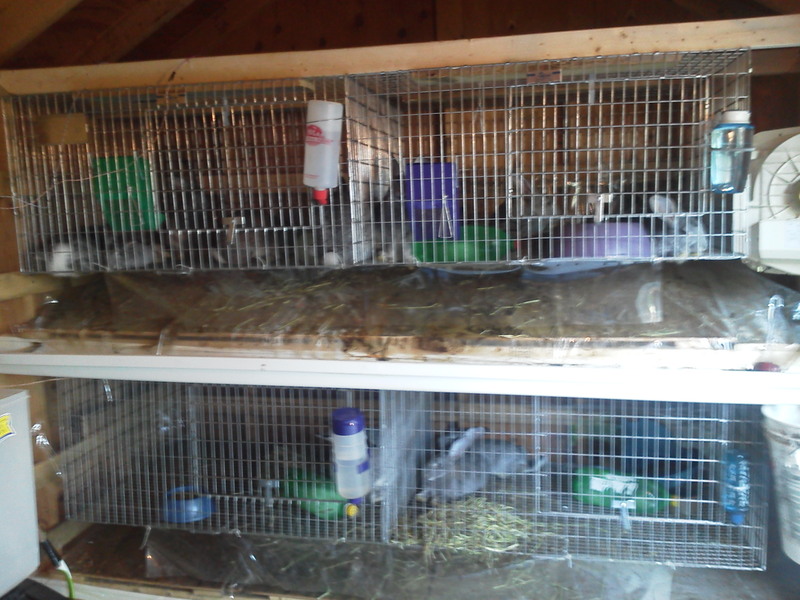 One of the best things about the Bunny Barn is that all of our supplies is not now in one place and close to the rabbits and the chickens where we use it. It saves so many trips back into the house to get feed or all the other supplies I forget when I try and do my morning chores before my coffee has had time start my brain. It also makes working with the rabbits in the rain or in the dark a lot more enjoyable. I am able to sit out with them and groom them with out having to worry about the dogs or the crazy bird netting that drove me crazy everyday! We have had such a busy summer that I have not had a chance to write. But busy is good sometimes, especially when it involves planting, harvesting, building and other farm activities. In the last month we have finished the first half of our aquaponics system, finished the bunny barn, harvested and replanted the garden, raised bunnies and started more baby chicks. I am going to try and write about each one of those things over the next week. Wish me luck! First, I wanted to take a moment and think about the people in Colorado. There is a blog that I follow that is about a homesteading family in the mountains in Colorado. They have left their homestead, had to find new homes for all their animals, and are told that they can not go back to their house for 6-9 months. I can not even imagine! Reading about what they are going through really puts me in my place… I have nothing to complain about! My house is not perfect, my kids drive me nuts sometimes and there is always work to be done… But praise God I have a house, kids and work. Please do not become numb to the suffering of others. If nothing else, it helps us keep our lives in prospective. OK, I dried my tears and now I am ready to tell you about the great things we have done this summer. We have finally finished our aquaponics system! Eventually we would like to have two systems up and running, but we are very excited about the one right now! For those of you that have no idea what I am talking about let me tell you about my system. It started with a 275 gallon pallet tank, this is the home for our fish. 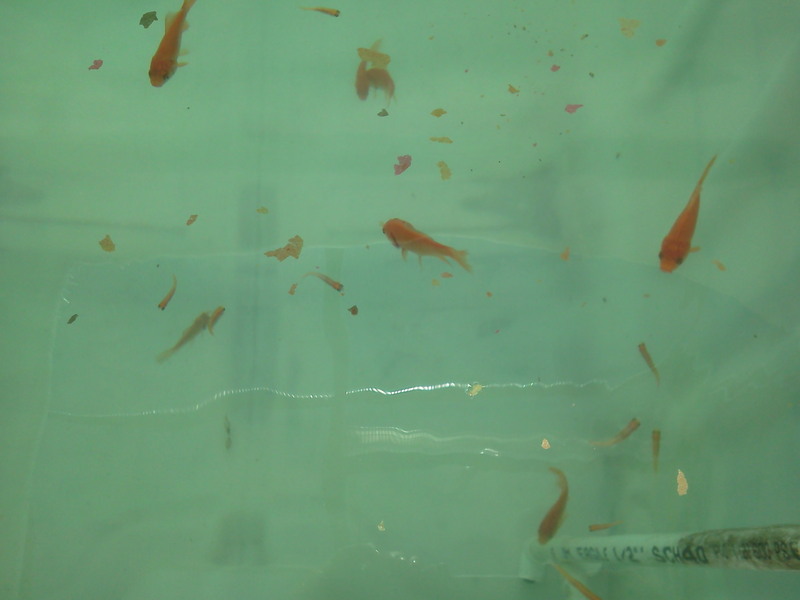 We currently have just pond gold fish in there because they are more tolerant of our errors and the learning curve. In February the gold fish will be replaced with tilapia. There is a pipe that the top of the fish tank that overflows into a gravel plant bed. In the gravel bed we have tomato plants, and beans. The gravel bed is a flood and drain system. Meaning just that, it fills up with water and then it empties. The process repeats itself all the time, keeping the roots of the plants wet. When this bed drains it empties into a sump bed or a deep water culture bed. Currently, this bed just has a couple feeder fish in it to keep up with the mosquito larva. But normally this bed would have a floating foam raft with lettuce and other greens growing in it. I will post a picture of that when I have it in the system, right now I am still starting the seeds. We had a batch of bad seeds and I had to start over, it was very sad. In the bottom of the sump bed there is a pump that pumps the water back up and into the fish tank… and the process starts all over again. You can see the black pump in the water and the white PVC pipe going up the side of the tank. 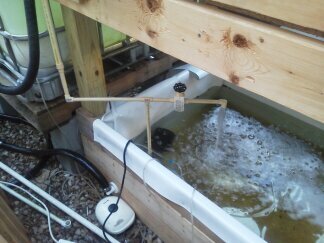 Most of you can stop reading here, but for our aquaponics friends I will let you know what supplies we used. ~The bed liner is Dura Skrim 20 WW 6’ x 50’ from Global Plastic Sheeting. 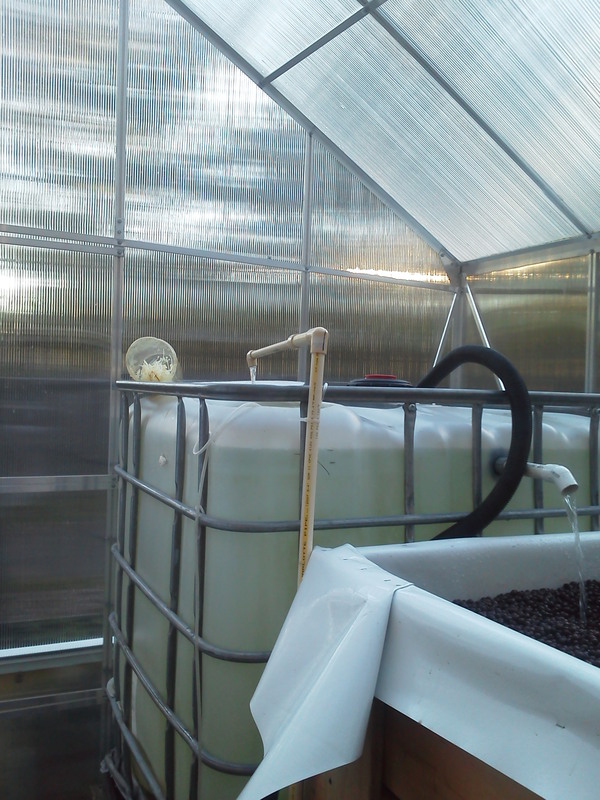 ~The pump is ActiveAqua Pump 500 GPH from the Aquaponics Store. 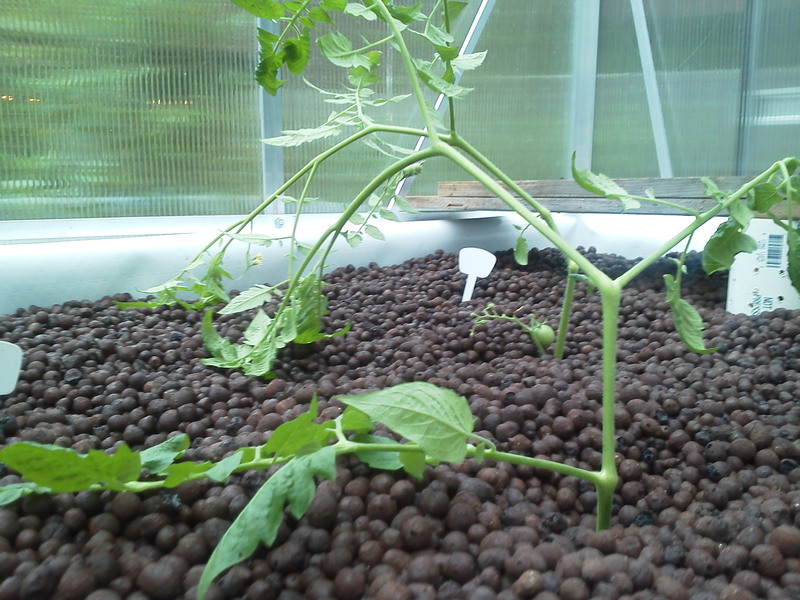 ~The net pots for the floating rafter were also from the Aquaponics Store. ~The Grow media is ViaStone from the Home Depot. ~The tank is off craigslist. ~The greenhouse is 12×10 from Harbor Freight. If you have any specific questions let me know. We are very happy with it and we look forward to what it is going to do through the winter.